Two more days! I've updated the application list. Make sure to follow the instructions for applications. I think Batrachian is complete. Let me know if you need or want anything more. Appearance: Selphina is slightly taller than average for a female elf, generally coming in a couple of inches under most men of her race. She is all the things that one would expect of her in many regards simply due to blood and profession; elegant, graceful, fine boned and well spoken are many adjectives that one could associate with her presence. A typical elf in nearly all regards. As an adult Selphina’s age ventures into triple digits but in appearance, when compared to a human woman of similar maturity, slight lines at the corner of her eyes and an air of experience and sophistication would lend her the equivalence of someone in her mid, or breaching late, thirties. Her hair is a sheet of brown kept long for the sake of her own vanity, but Selphina employs a range of stylings to keep it from becoming a hindrance and it changes frequently, often adorned with clips and ornaments of which she is fond. Her clothing changes as her situation dictates, but it is clear from those who know Selphina well that she favours plainer clothing and mail - whatever is practical. Travelling in the desert is no fun for an elf and when doing so she wraps up to protect against the elements. Personality: Selphina’s overall demeanour is quietly affable and the woman is rarely seen without a small smile on her face. She prefers to project a professional and approachable disposition at both friends and acquaintances alike, her temperament ever steady. There are few that have ever seen her anger in such a manner as to raise her voice as Selphina prefers to solve disputes with words and good graces rather than bickering openly. When working, she manages her emotions so that she is unmoved by things like anger or joy or sadness. Whilst she definitely experiences these things having them under her thumb is part of her position. Losing control is not an option for her so she simply endures in a patient, elegant manner. In private, or during personal downtime, Selphina enjoys her feelings as much as anyone else. But these are kept quiet and the company she chooses to be such in are few and far between. Above all else however, Selphina exists to protect others, through potent magic or simply by sitting in on a peace talk between two rival businessmen. Even now, Selphina can sometimes be easily distracted if she sees or hears of someone in need. To her, duty and honour mean that it is her job to make sure that everyone from children, to the blacksmiths, to priests, to merchant princes, always have someone to ensure that they can live their lives free of threat, in peace and quiet. It is a pity, sometimes, that she rarely gets that herself. Selphina never knew her parents. She was an infant found crying in the desert by a travelling caravan, lucky not to have been food for resident scavengers or to have suffered an unfortunate end in the intense heat. 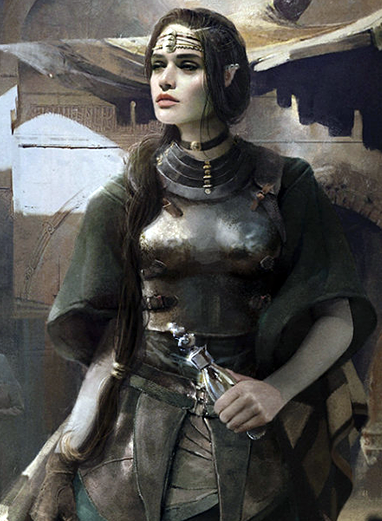 Huddled under a shard of sun bleached bones, her cries drew the attention of the trader’s guard and she was summarily adopted by a cleric of Eldath whom had been trading healing and diplomatic services in order for the protection afforded on route. A brass scaled dragonborn by the name of Miira, she became her mother in lieu of one, naming the elf after two poets she knew of her heritage. Miira was a kindly, ageing spirit when she picked up the elf child and was pleased to have new companion to spend time with. Her temple of origin close to the south pole of Vaun, she preferred to be on the road as much as possible and instilled in Selphina a healthy taste for compassion and a sense of adventure. There were holy sites to visit, clergy to meet and souls to inspire and to save. Selphina grew up a happy child into a genteel young teenager, assisting Miira in her duties. Eventually their relationship drifted from mother-daughter to master-apprentice and Selphina, in time, grew to know Eldath in the same fashion, able to call to and wield her magics. But Miira, although proud of her charge, was very much aware that time was not on her side. Already a little too old to have been carrying around a baby when Selphina had wailed her way into her life, her passing was a quiet, solemn affair a few years later after the pair had wandered their way back to their home temple in the south. After grieving Selphina decided that her adoptive mother would not have wanted her to, as she would have put it, 'mope around forever' and thusly took up their previous lifestyle once more, alone. Over the many years that Selphina has been ‘on the road’ since then she has experienced much, made friends and enemies both and taken a quiet approach to her goddess. Suffering from a distaste for open preaching of Eldath's ways, instead Selphina prefers to have more private, intimate discussions with those who are curious about her religion and of her teachings, finding this a better tool for answering questions and instilling a sense of faith in others. Much like Miira, the elven woman returns ‘home’ rarely, preferring to lend her services to wherever and whomever needs her the most. Yslip is somewhere she has visited often. A good hub for work, diplomatic or otherwise, and an excellent spot for resupplying and meeting old friends, having an Eldathan cleric on hand to downplay conflicts and provide healing aid is what has led her into current company. Selphina, perhaps to her detriment on occasion, is someone who finds it hard to say no when she knows that she provides valuable aid. Just sometimes perhaps not in the way that person is expecting. “Lovely,” Miira only spared the ogre the briefest glance before turning back to her allies to make sure they were whole. When an orc got too close, the dragonborn swung her mace in a sweeping arch to push it away. The metal clanged loudly against the remaining armor the creatures wore, and each solid hit sent vibrations through her claws that made her wrists feel numb. She didn’t need to attack them—as far as she could tell, she just needed to set them in the path of the two warriors and focus on her supportive spells. Her eyes met those of the elven woman at her side for a moment as she turned away. The ogre closed in on the group, its bellow loud and hitting her full in the chest. Selphina watched it charge forward toward the dragonborn woman, only to be slammed back with ice and fire from...somewhere in this ridiculous melee. Selphina followed, aiming four bolts toward the ogre as she slammed the jagged end of her own mace into the ground. The white orbs of energy seemed to have no effect, doing nothing more than snapping on tough skin and disappearing like smoke. Around her, the battle raged harder. The moment she saw the ogre surge forward, Selphina assumed the worst and she shouted a warning that came too late. She had gotten too close and the ogre’s fist swung and swiped at her, knocking the old cleric off her feet. The barrier caught the brunt of the hit, leaving her with the force of the collision and the fall that knocked the wind out of her lungs. Before she could get up, the ogre slammed its hands down onto the rockface under the sand and sent shockwaves out to those nearby. Selphina was knocked back a few more feet, her head cracking against the ground. Her ears rang and her head swam as the world fogged up. Terrible. Utterly terrible. Evidentially, the church and all the books she had read had not prepared her to get killed by orcs and ogres. Selphina Valmaris was far too young for all this if they were honest with each other. But sometimes, sometimes, you didn’t get a choice. And so, with a colossal groan, the elf stood up, shaky on her two feet. She was pretty sure that her arm was broken but they could see to that later. Whenl the wind whistled over a peaceful dune. Or her last breath left her body. Last edited by Trash Toad; 06-07-2018 at 05:07 PM. A little over 12 hours until the application deadline. Get those apps complete! I'm sorry, Fig but I'm gonna have to withdraw my character. I have quite a bit on my plate and want to avoid getting burned out. Sorry to hear that, Art. Will update the first post. Another note, I do not know if your application is complete unless you PM me, post here, or update the application post. Don't assume that when the deadline hits, I know if your application is complete. Last edited by figtickler; 06-08-2018 at 03:23 PM. Good luck and good gaming to whomever is chosen. You can find the game threads here. Please start working on your character sheets, following the instructions in the Group Roster thread. Hello! We are reopening applications for this game! We are looking for two, possibly 3 more players. Feel free to ask any questions. If you would like to resubmit the application you posted originally, please let me know. Note: the group does not currently have a dedicated healer. I am interested. I am debating using the old application or making a new character. When is the deadline for new applications? ASAP is preferable. Things are slow here, so no true deadline.